After painting your Gunpla kit, it is recommended to apply decals to improve the realism and coolness of your Gundam plastic model. Applying decals can sometimes be intimidating, but just a like finished race car, your Gundam will ultimately look more professional and genuine with decals. In the end you will be glad that you put them on your kit! 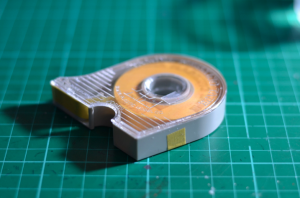 Clear stickers can employ added detail to your Gunpla kit, and they are the easiest to apply compared to the other two types of decals; this is because they work in the same way as the foil stickers that are usually included in HG kits. 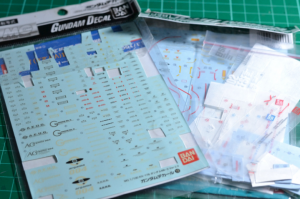 Real Grade kits will have huge amounts of these clear stickers, and they are quite tiny, so it is best to use the right tools when applying them. The tools you can use to do this will be discussed below. The only disadvantage of clear stickers is that they have a rectangular edge that can be seen when the kit is viewed up close. Tutorials on how to apply clear stickers can be found in the previous articles. Dry transfer decals are a bit of a challenge to apply the first time, but you’ll be glad when you perfect the technique! Dry transfer decals are mostly included in MG kits like Strike Freedom or the ver. Ka line of MG kits. Dry transfer decals look better when applied compared to clear stickers, but they can destroyed easily when applied improperly. Water slide decals appear natural when applied, as if they are painted onto the kit. Using these types of decals requires extra tools and equipment, but don’t worry! The tools are readily available in your favourite hobby store. If you can practice and get accustomed to applying water slide decals, you will be well on your way to having a better-looking Gunpla model. Whether using water slide decals or dry transfer decals, you need an x-acto (hobby) knife (or really any hobby knife) to cut individual decals out of the decal sheet. To prevent the decals from being damaged during cutting, it is recommended to have a sharp blade installed. Of course, please remember not to cut yourself! Use a cutting mat to prevent damage to your work desk/table. Tweezers are used to apply clear stickers or hold water slide decals for application. 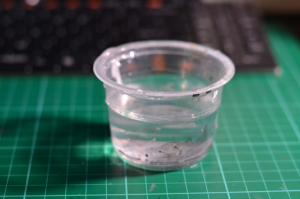 You can also use them to retrieve water slide decals that you have dipped in your water container, which you will learn how to do in the videos below. Use masking tape to hold the dry transfer decal in position for dry rub application; see a demonstration of this process below. To prevent any distortion or damage to the dry transfer decal when dry rubbing is done, it is very important that you hold it securely in position on the surface of the Gunpla piece where you are applying it. You will only need to use this for water slide decals. How does it work? The decal will only come off the decal sheet if you dip it in water, similar to the mechanics of envelope seals or letter stamps. After submerging the water slide decal for around 15 seconds, you can retrieve it and apply it to your Gunpla model. When it has dried, the decal will stick completely to whatever surface you applied it to. For even more accurate application, please use Mr. Mark Setter. This one is for cleaning your ears—no, just kidding! For your purpose, the cotton swabs are used for absorbing excess water that has accumulated on the Gunpla surface from the applied water slide decal. It is also used to apply the water slide decal itself using a ‘sliding’ motion, hence decal’s name. Just slide the decal onto the Gunpla surface. Apply Mr. Mark Setter after the water slide has been set in place and you are happy with its position. It will help the decal to set and stick well to the plastic surface. 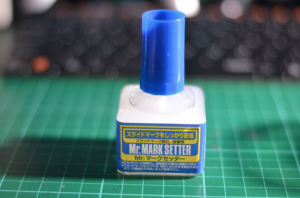 There is also another tool called Mr. Mark Softer which will soften your water slide decal further and help the water slide decal to bind onto the surface of the Gunpla. And of course the most important materials are the decals themselves! Some kits already include water slide or dry transfer decals. There are many decal sheets to choose from. You can buy extra decal sheets at your favourite hobby store, or even use extra decals left over from previous kits. To avoid damage or distortion, make sure that your dry transfer decal is secured and locked down by an adhesive before dry rubbing it onto the Gunpla surface. 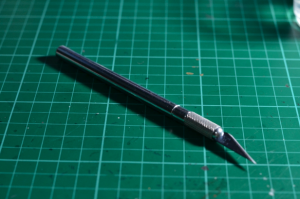 For dry rubbing the dry transfer decal on your Gunpla surface, you can use an empty ball point pen or the dull end of your tweezers. Toothpicks are also fine, but just make sure they are sturdy enough for dry rubbing. Think scratch cards—coins may also be a possibility, although you will have to test that for yourself. To prevent a neighboring decal from being accidentally transferred, it is better to cut out your decals individually. Before applying Mr. Mark Setter to your water slide decals, make sure to absorb extra water using cotton swabs and take care to position your decals carefully. Even after the water slide decals have dried and Mr. Mark Setter has been applied, dried water slide decals are still fragile. For an extra layer of protection, it is best to seal your water slide decals using Topcoat sprays or clear matte sprays. This also applies to dry transfer decals. Have adequate lighting and proper posture when applying your decals, since the process might take a long time and strain your neck and back. It is also wise to have a well-positioned seat. After a bit of practice, and you will be on your way to becoming a decal master! Whatever stage you’re in, the important thing is to enjoy yourself and have fun in your craft. Just do that, and you’ll have a final product you can be proud of. 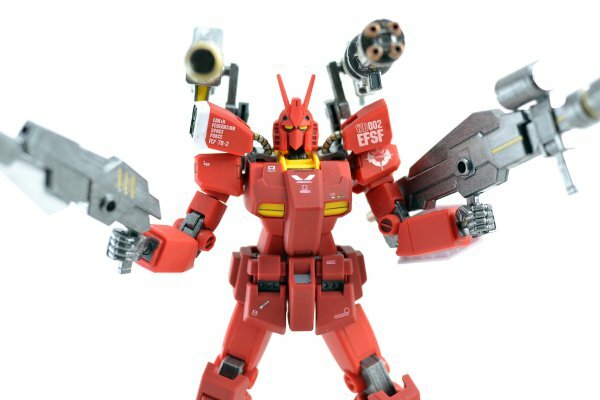 Of course, Gunpla making doesn’t just stop at decals, check out our other guide on how to paint realistic Gundam models. 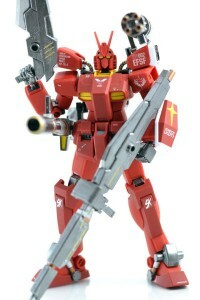 You may also buy the Gunpla model here: Amazing Red Warrior.